February 19, 2014 July 15, 2018 P.O.P. On January 31, Media Matters published, as it does every year, an analysis of the biases exhibited in the Sunday network news talk shows during the preceding year. And even though its findings pretty much replicated what it discovers every year with a similar survey, the results might be quite a surprise to many people. Because contrary to the persistent narrative we hear about the “liberal media” dominating the American landscape, the survey, as always, indicates a very pronounced right-wing bias in mainstream media. Now you may say that Media Matters is itself biased, and so this survey can’t be trusted. And you’d be half right. Media Matters is definitely biased, as I’ve mentioned before. But bias in itself isn’t necessarily a problem; biased is not a synonym for inaccurate or dishonest, even if they frequently all go together. (See previous post, Shades Of Subjectivity). Media Matters has an extraordinary track record of honesty, accuracy, and even balance. If you can find a more accurate accounting of media bias during the past year than the one it presents, I’d love to see it. Besides, the type of survey in question is pretty much foolproof. Media Matters did not attempt to determine the biases evident in the stances taken on various issues, as that would have entailed too much subjective judgment. Instead, what it did was tally the biases of the personalities involved. And it’s almost always a simple matter to determine whether an individual — particularly a public figure — has exhibited an ideological position, and if so, what it is. Only one network, ABC, displayed even a slight tilt to the left: it leaned slightly leftward on 3 of the factors, rightward on 2 of them, and was evenly balanced on the other. The other three networks were, with the exception of a single instance, consistently “conservative”, often to an extreme degree. The single deviation was that in the category of elected and appointed administration official guests NBC’s Meet the Press hosted “liberals” over “conservatives” by a slim 50-48 margin — hardly stunning given that it’s a Democratic administration. Nonetheless, Fox managed to dig up more Republicans to interview. 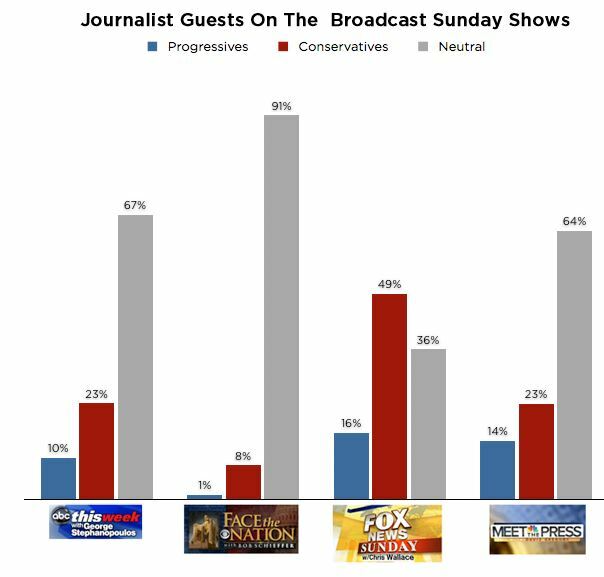 As you can see, all 4 networks featured far more “conservative” than “liberal” journalists, even though allegedly there are far more “liberal” journalists to pick from. 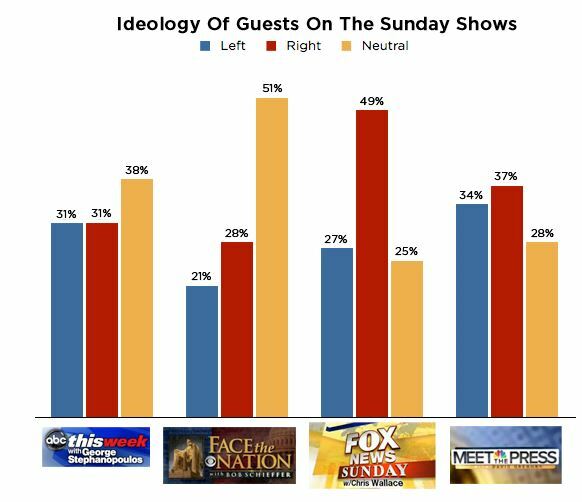 Yet 3 of the networks featured far more independents than either left or right; but good old fairandbalanced Fox had considerably more “conservative” than neutral journalists. In his 2003 book What Liberal Media?, Eric Alterman comments that the persistent hammering away at the narrative of the “liberal media” is part of a tactic that he calls “working the refs”: by constantly complaining about a supposed “liberal” bias, the right-wing punditocracy hopes to nudge the mainstream media even farther rightward than it already is. If that’s the case, the strategy seems to be working quite handsomely. Previous Misquoting Gore. Again. Still. One important thing to note is the media’s balanced yet biased, reporting, which exploits the ideal that both sides of each issue are so important to reporters—that all the hogwash of lie and misinformation aimed at Climate scientists who dare to confuse us with the facts, are given much more credibility than they ever deserved! For example, if a news outlet were determined to offer completely balanced reporting about something as horrible and heinous as the holocaust, would that necessitate that they must also report many of the bizarre ideas held by neo-Nazis and Skinheads who insist that it never even happened? Would this be necessary despite the thousands of images and reports from those that survived it, or necessary despite the overwhelming mountain of evidence that confirms it—including eyewitness reports from the soldiers that liberated Jewish prisoners? Like it or not, basically the same kind of thing has crippled the perfectly rational and honest reporting of global warming which indicates an overwhelming consensus about mans pivotal and primary role. Why should stories that are well known to be false, or those that are misunderstood by the press, but known to be patently misleading by enlightened scientists, be given equal time? Why should all those bizarre reports coming from inside the rabbit hole, and from the Mad-hatters Tea Party guests who are so carefully muddled by Republicans propaganda and the media’s willingness to humor their madness, get equal air time anyway? Balancing reporting about both sides of rational issues is always constructive. But, when the press takes the bait of various conspiracy theorists and pseudo scientists who would deny the nose on their faces if that included some sort of political of financial gain–how can that be considered as honest reporting in a supposed democracy with a free press? President Obama is absolutely right to report that the guess work is over, and we now know that climate change due to man, is a fact. But unfortunately much of the power and influence held by wealthy special interest, still exerts far too much influence on our erstwhile free press. Changing this reality will require great courage and ethical commitment from the news media, since if ordinary citizens don’t have access to the truth, they then cannot exert the power of their vote, in defense of a government by the people, and the right to have access to truthful news coverage. Where is the spirit of Edward R. Murrow? It would be so great if major and local news outlets began running stories which detailed the campaign of disinformation pursued by coal and oil companies which actually threatens our health far more than smoking the Marlborough straights which were defended as being harmless by those who had a large interest in lying about tobacco for economic gain. Great post with featuring another round of excellent myth busting! I once fell for the ‘librul media’ propaganda way back when I was a young conservative. I read Bias, by Bernard Goldberg, and even then I didn’t think it had much merit, and since that time, the media has titled so far to the right it no longer functions as a media. Another great post. Well done! Thanks. “Bias”, as you probably realize, was little more than one person’s vendetta.